Kerala lives along these backwaters. They snake over the state physique, bestowing paddy fields with good harvests, and provide the whole village with drinking water and other facilities. The backwaters refer to the large inland lakes of Kerala. Today these backwaters act as vital water ways for the transport of people and produce. Kerala Backwaters - A houseboat ride through the placid backwaters of Kerala and enjoy a cruise through the natural vistas of God's Own Country. Kerala is a labyrinth of lazily meandering backwaters. Sprinkled with traditional houseboats, country crafts, rural lifestyles and Tranquility. It's an intricate network of innumerable lagoons, lakes, canals, estuaries and the deltas of forty-four rivers that drain into the Arabian Sea. Over 900 km of this labyrinthine water world is navigable. The largest backwater stretch in Kerala is the Vembanad lake which flows through three districts and opens out into the sea at the Kochi port. The lagoons, lakes, canals and rivers are lined up with dense tropical vegetation on either side. It is a breathtaking bout to experience a solitary and calm glide through this network of waterways. The backwaters form a specially attractive and economically valuable feature of Kerala. They include lakes and ocean inlets which stretch irregularly along the coast. The biggest backwater is the Vembabad lake, some 200 sq kilometers in area, which opens out into the Arabian Sea at Cochin port. The Periyar, Pamba, Manimala, Achenkovil, Meenachil and Moovattupuzha rivers drain into this lake. Veli, Kadhinamkulam, Anjengo (Anju Thengu), Edava, Nadayara, Paravoor, Ashtamudi (in Kollam Dist.) Kayamkulam, Kodungallur (in Trissur Dist) and Chetuva are some of the other places where you may go for backwater cruising. The backwaters of Kerala stretch over 1900 Kilometers, providing drinking water and irrigation facilities. This serene backwater stretch, en-route to Kovalam, is famous for its canoe rides. It is the meeting point of two rivers-Killi and Karamana. A temple dedicated to Parashurama, the legendary founder of Kerala, is located in Thiruvallam. Alumkadavu is halfway on the route to Alappuzha from Kollam. This quiet little backwater village in Karunagapally town is famed for its boat building yard. It is here that the gigantic kettuvalloms (cargo boats of rural Kerala) were built. Today the Kettuvalloms which were long replaced by modern means of transport, have been converted into houseboats. 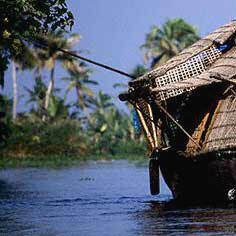 Kuttanad, called the rice bowl of Kerala, because of her wealth of paddy crops is at the very heart of the backwaters. The scenic countryside of Kuttanad with its shimmering waterways also has a rich crop of bananas. Yams and cassava which accompany the rice bowl as "side dishes". 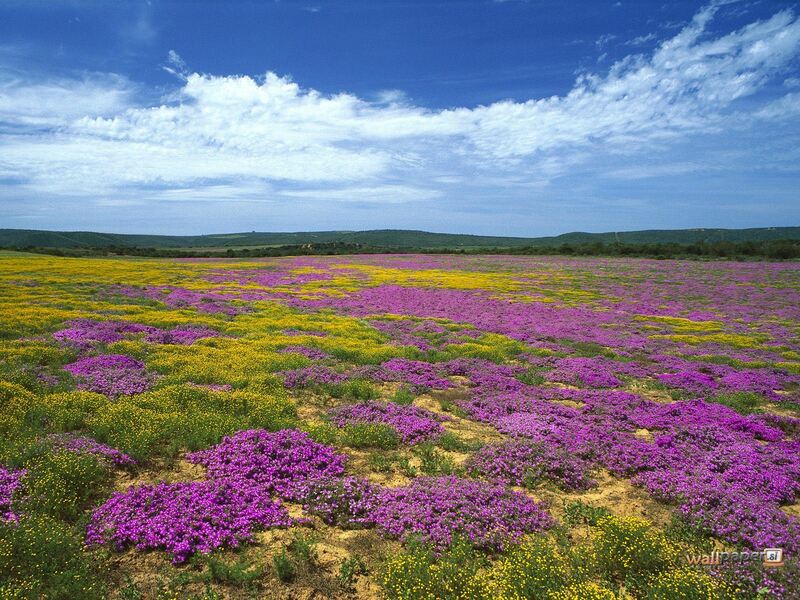 This is one of the places in the world where farming is done below sea level. Inland waterways which flow above land level is an amazing feature of this unique land. This little island on the backwaters is a favourite haunt of hundreds of rare migratory birds from different parts of the world. This island is accessible only by boat. Bordered by the lofty Western Ghats on the east, the Vembanad Lake and the paddy fields of Kuttanad on the west, Kottayam is a land of unique characteristics. The enchanting backwater destination of Kumarakom is a small village that is a cluster of little islands on the Vembanad Lake in Kerela. Kumarakom strengthens Kerala�s reputation for being God�s own country with its unbelievably beautiful mangrove forests, coconut groves and emerald green paddy fields interspersed with enchanting waterways and canals adorned with white lilies. It is part of the Kuttanad region, and the bird sanctuary here spread across 14 acres of any ornithologist's paradise. The lake opens out into the Arabian Sea here to form one of the finest natural harbours in the world. It is this natural advantage that has made Kochi a fascinating blend of the cultures and influences of the explorers and traders who visited this wealthy land. The Arabs, Chinese, Portuguese, Dutch and the British have all left their mark here. The Jewish synagogue, the Dutch palace, the Chinese fishing nets, and other remnants of European and Asian architecture merge smoothly into the traditional fabric of the seaport city. Half the fun of visiting Kochi is moving around on the local ferries. A conducted cruise through the winding waterways will take you to several quaint spots. Once the capital of the powerful Zamorins, a prominent trade and commerce centre and the land of the Malabar Mahotsavam, Kozhikode was the most important region of Malabar in days past. Today, ancient monuments, lush green countryside, serene beaches, historic sites, wildlife sanctuaries, rivers, hills, a unique culture and a warm, friendly ambience make this district a much sought after destination. 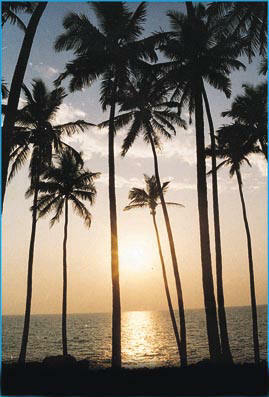 Unexplored, unspoiled, the backwaters of Kozhikode hold great promises of enchanting holiday options. Elathur, the Canoli Canal and the Kallai River are favourite places for boating. Kadalundi, with its beautiful bird sanctuary is a charming site. Korapuzha, the venue of the Korapuzha Jalotsavam (water fiesta) is becoming a popular water sport destination. The northernmost district of Kerala, Kasaragode is situated on the sea coast with the Western Ghats on its east and northern borders. Backwater trips on the Chandragiri River and at Valiyaparamba are fascinating experiences. Situated on the Chandragiri River, southeast of Kasaragode town, this town is known for the large 17th century Chandragiri Fort, one of a chain of forts. It offers a breathtaking view of the river and the Arabian Sea. It is a vantage point to watch the sunset. Boat trips to nearby islands and palm groves are available. Boarding point : Chandragiri bridge. This is perhaps the most scenic backwater stretch in Kerala. Fed by four rivers and dotted with numerous little islands, Valiyaparamba is fastly turning into a much favoured backwater resort.